With over 50 years of history and rich experience behind it, Brakes India Private Limited as part of the six billion dollar TVS group is getting future ready for the opportunities ahead. Established in 1962 as a joint venture between the TVS Group and Lucas Industries Limited U.K (100% subsidiary of ZF TRW), Brakes India has grown to become the largest Brake system supplier in India today. Technology Leadership, Operational Excellence and Superior Service. With a well equipped R&D center capable of designing, developing, testing and validating products, the core strength of Brakes India Private Limited lies in it’s extensive knowledge of the Indian market, conditions and customer. With a 150 strong engineering dept supported by world class facilities including a state of the art test track with ABS testing capability, Brakes India Private Limited prides itself with tailoring designs to suit the Indian requirement. Brakes India Private Limited’s customers involve the company early at the concept stage while developing new products. Sourcing the right technology depending on the application, customer requirement or follow source, Brakes India Private Limited has access to a wide range of technologies within the company, JV partner ZF-TRW or through strategic alliance partners. Complimenting a strong design and development capability, Brakes India Private Limited has strengthened itself with sustainable operational excellence. Reaching world class Quality PPM levels with a systematic focus on fit form and function, Brakes India Private Limited has gone the extra mile in ensuring the same quality standards with Tier II suppliers as well. Apart from being certified for TS16949, IS 14001, 18001 and achieving the Ford Q1 status, Brakes India Private Limited has been unwavering in its relentless pursuit of quality excellence. In recognition of these efforts, Brakes India Private Limited has been granted the TPM special award for manufacturing excellence by the Japan Institute of Plant Maintenance. In this fiercely competitive market, Brakes India Private Limited has been able to create added value by blending optimised design with ease of manufacture. With a view to providing superior service to the end customer, Brakes India Private Limited as a strategy has, so far, established 3 mother plants manufacturing core products and 8 satellite plants close to our customers spread across India geographically. Aligning our entire supply chain to provide flexibility in a high variety low volume market like India, Brakes India Private Limited has been able to achieve a high degree of accuracy in delivery and consistent quality. Today, Brakes India Private Limited exports Brake products and castings to countries around the world including USA, Europe and Japan. 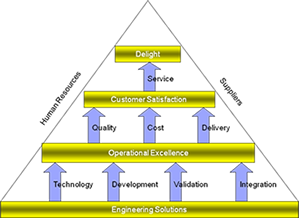 In today’s business environment where customer expectations are constantly rising, the need to add value and differentiate to achieve a high degree of customer satisfaction becomes paramount. With this in mind, Brakes India Private Limited has embarked on a service initiative covering OEM’s, spare parts and technical service. With over 45 field engineers exclusively looking after customers, products and spare parts in the field from launch to obsolescence, Brakes India Private Limited is ready to raise the bar to provide unsurpassed and superior service. Collaborating with OEM’s to eliminate customer irritation in the field and a constant exchange of information on product performance has paid rich dividends in increasing transparency and improving customer satisfaction levels. All this would not have been possible without our human capital; our capable and motivated workforce. Strong HRD practices that select and develop our human resource with passion has been the backbone of Brakes India Private Limited’s success story. With skill development centers, technical training institutes and service training schools, Brakes India Private Limited has developed a robust training program for developing their employees into achieving their personal goals and company objectives. Providing a healthy and clean work environment in and outside of the office is a high priority in Brakes India Private Limited. Starting with greening of the factory premises, rainwater harvesting, usage of wind power, cooking with bio gas and so on, Brakes India Private Limited has been a pioneer when it comes to taking care of mother earth. Brakes India Private Limited’s goals are clear. Enhance their leadership position in the Indian market by offering products of world class quality at a reasonable price. Enhance their business potential by supporting partners globally thru JV’s or strategic alliances and to synergize Brakes India Private Limited’s competitive cost manufacturing with technology partners to support emerging markets.